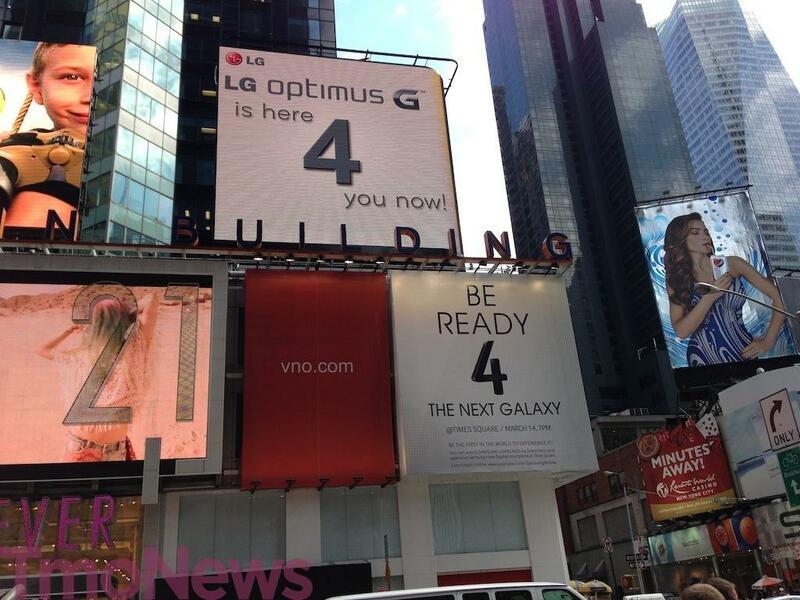 LG isn’t wasting any time getting the jump on Samsung with this billboard in Times Square. Classy or tacky marketing? I’ll let you be the judge but as I just hunted this down in Times Square after seeing it pop up online earlier this morning, it definitely had people stopping and talking. That likely serves Samsung better than LG since at least some of the people I overheard talking seemed well aware that Samsung has a big unveiling today. To be clear, I’m not saying they just read the signs and saw todays date, but genuinely aware that Samsung is set to launch something big. All that money Samsung is spending on marketing just continues to do wonders for word of mouth. Begun this Times Square marketing war has. I do love good competition. Good for them. Samsung trolled Apple all of last year in their commercials and ended up becoming a household name (Galaxy SIII). It’s only fair. Why the other three got Optimus G and T-Mobile only has N4????? AT&T & Sprint got the Optimus G. Verizon didn’t. Exactly what I was thinking… make LG Optimus available across all carriers, then we can start talking. As someone who has the Optimus, its a great phone. The battery life itself is amazing! I got it internationally but its worth every penny. First step for LG needs to be getting their flagship available across all 4 carriers. Good to see competition for Samsung though. Should lead to better phones. The specs on the LG Optimus G are appealing, but there’s no doubt in my mind that Samsung is going to drop it like it’s hot, drop it like it’s hot, drop it like it’s hot. I can’t wait to sell the Galaxy S IV. It seems effective for Times Square, even if it is a bit tacky or corny. Maybe LG is taking a page from Samsung’s book with their marketing against Apple (Samsung was far better at it, though). A little over two years ago, some people thought that Samsung should just stick to televisions. Now, Samsung is a major player in the mobile device arena. Who knows what the next two years will bring. Like the comment, dislike the spam link. The only phone worth mentioning in LG’s lineup is the Nexus 4…and its more associated with Google rather than LG.